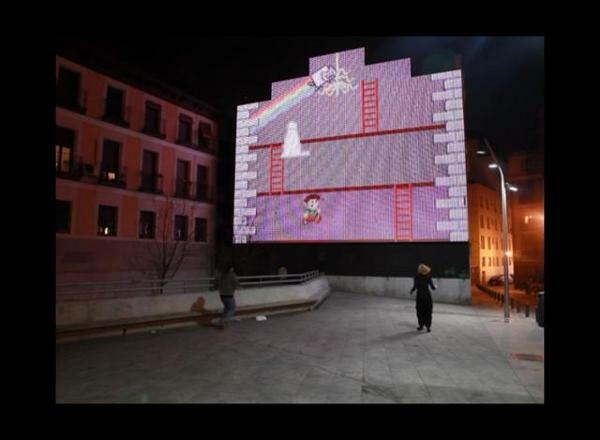 During the Big Games workshop at Medialab-Prado we developed two working game prototypes for the media façade. Ghost at Medialab was created by Fernanda Ramos and me. The media façade is used to show the interior of the building, where the player needs to reach the top floor while avoiding a ghost which persues him. Ghost in Medialab test from Nacho Cossío on Vimeo. Multiplayer Pong was created by Fernanda Ramos, Javier Villarroel, Valeria Okonis and me. Multiple players collaborate in two teams in the classical Pong game. Pong test on Medialab digital façade from Nacho Cossío on Vimeo.